One of the topics I keep coming back in this blog is about the workplace and different aspects of making that better for the organization, manager, and employees. Books such as The Carrot Principle talk about incentive structures and how they can be used effectively to arrive at a happy and productive workforce. Books like The Starfish and the Spider talk about organizational structures and how structures themselves affect how an organization performs, grows, transmits and retains knowledge. I had also written about the Shane Battier Effect and how some amazing team players focus on maximizing the contribution from their team and using that as their metric of success rather than just their personal accomplishments. In a post titled The Batmobile and race cars on my Wharton blog, I had addressed the other side of the equation – employees that felt like they had multiple skills and were being under-utilized only along one of those dimensions. In this post and the next one, I hope to highlight a couple of awesome books focused around traits of the leader herself. I just got done with reading Multipliers, a great book full of skills you can teach yourself to be a better leader. This was referred to me by Prof. Adam Grant, who’s book is next on my list (Give and Take) in response to my question about any work done on the Shane Battier Effect. 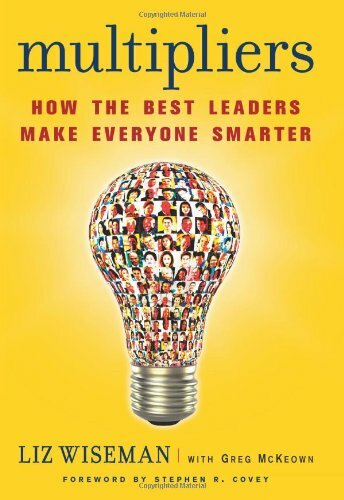 The authors condense a lot of research done with successful entrepreneurs and business leaders into a few key skills that they use to distinguish the multipliers from the diminishers, and then provide concrete steps that we can take to go from being diminishers, willful or accidental, to multipliers that get the best out of their co-workers and build leaders in their wake, not just yes-men. Taking a leaf from the work of folks like Chip&Dan Heath on how to make ideas stick (Made to Stick) they give these five broad disciplines simple and catchy titles – ‘The Talent Magnet’, ‘The Liberator’, ‘The Challenger’, ‘The Debate Maker’ and ‘The Investor’. Each of these disciplines has real world examples from leaders that exemplify that trait – from Ela Bhatt of SEWA to Abraham Lincoln. All in all, a great read and a good book to have on your bookshelf as reference material for personal advancement.